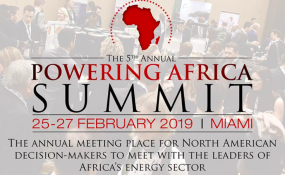 The 5th Powering Africa: Summit (PAS) will take place for the first time in Miami from the 25-27th February 2019 at the JW Marriott Miami. The Summit will welcome over 370 investors to Miami from across North America, Africa and Europe to present energy projects, discuss investment opportunities and build relationships within the international power community. The 5th Powering Africa: Summit at the JW Marriott Hotel in Miami will host over 370 investors and public and private stakeholders across Africa's energy sector. The World Bank, OPIC, MCC, Power Africa, USAID and USADF alongside African energy leaders from Morocco, Ethiopia, South Africa, Kenya, Uganda, Mozambique and Nigeria are attending the summit to explore how Florida is shaping its energy mix and to seek new innovative partnerships. "With dozens of partners and government officials from all over the world attending we have seen deals get unstuck, in real time, at the Summit," Andrew Herscowitz, Coordinator, Power Africa. Energynet is hosting the 3rd Latin America Energy Forum (LAEF) alongside the Powering Africa: Summit. LAEF will bring together government leaders and senior decision makers from the US and Latin America to explore the region's energy mix and the role of gas in support of the expanded use of nonconventional renewables. Copyright © 2019 EnergyNet. All rights reserved. Distributed by AllAfrica Global Media (allAfrica.com). To contact the copyright holder directly for corrections — or for permission to republish or make other authorized use of this material, click here.